WELLS, Maine — Several whales, including both minke and humpback, have been seen feeding close to shore along the Seacoast in recent weeks, giving both boaters and spectators watching from land a rare glimpse of some of the Atlantic Ocean’s largest mammals. Nik Charov, president of Laudholm Trust, said there have been quite a few whales off Wells Beach the last few weeks, both minke’s and humpbacks. Last Friday a humpback whale delighted dozens of visitors to Laudholm Beach as it fed just off shore, Charov said. Glenn Hodgkins, an avid birder from Hallowell, was at Wells Reserve at Laudholm Friday and was thrilled to capture not one, but two rare wildlife sightings. Hodgkins was at Wells Reserve, one of the top birding sites in Maine, looking for the Western Kingbird that had been spotted there earlier in the day. He found, and photographed the beautiful gray and yellow bird, a very rare sighting in Maine, and also captured the humpback whale feeding near the shore. Suzanne Kahn, education director at Wells Reserve, sent Hodgkins’ photo of the whale’s tail to experts at the Allied Whale Marine Mammal Research Lab, at College of the Atlantic in Bar Harbor, where it was confirmed to be a humpback. “It was very exciting seeing the active humpback from the beach. Many people on the beach were thrilled with that,” Hodgkins said. Charov said in his seven years at Wells Reserve he hasn’t seen any whales this close to shore. Experts say rising water temperatures have drawn the whales closer to shore this year. Tony LaCasse, spokesman for the New England Aquarium in Boston, Massachusetts, said the higher water temperatures, believed to be brought on by climate change, have led to bait fish called menhaden, locally known as “pogies,” appearing closer to shore. Pogies, he said, eat plankton that have been growing closer to shore because of the higher water temperatures, and several animals including the whales eat the pogies, following them near land. Drone footage of a whale feeding off the coast of Seabrook, New Hampshire, over Labor Day weekend went viral this week and made news headlines. In recent weeks, photos from both boaters and beachgoers of the whales feeding from Kennebunkport to Wells have been popping up all over social media. LaCasse said whales have been seen close to shore throughout the region this year with sightings in the mouth of the inner harbor in Boston. New England news stations showed footage recently of a whale in Beverly Harbor in Massachusetts lunge feeding, plowing through a school of fish to gulp a couple hundred pogies in its mouth while sending another hundred or so flying through the air, he said. 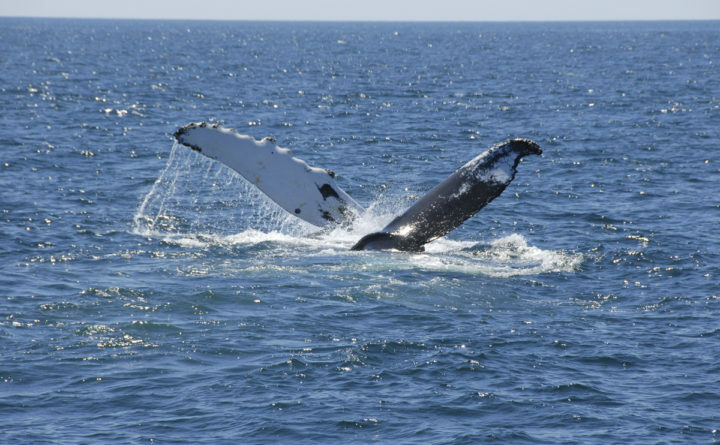 In Kennebunk, visitors on the First Chance Whale Watch charters have been treated to numerous whale sightings, including a breaching young humpback on Aug. 31. “They’re going to be close to shore so long as the menhaden are here,” LaCasse said. He said the menhaden will migrate from the area when the temperature starts to drop. Charov said there were no reported sightings on Monday, which was a cooler day. LaCasse said the Gulf of Maine is one of the most rapidly changing bodies of water in the world, and that water temperatures in the region are higher than they were in 2010. Then, water temperatures did not rise above 70 degrees Fahrenheit as frequently as they have this summer. Andy Pershing, a marine scientist with the Gulf of Maine Research Institute in Portland, last month said the average sea surface temperature in the gulf was nearly 5 degrees Fahrenheit above the long-term average during one 10-day stretch in August. Aug. 8 this year was the second warmest day in recorded history in the gulf, and there were other sustained stretches this summer that were a few degrees higher than the average from 1982 to 2011, Pershing said. He characterized this year as “especially warm” even for a body of water that he and other scientists previously identified as warming faster than 99 percent of the global ocean. People who see whales up close should keep their distance, said LaCasse, for their safety and that of the whales. Whales can suffer serious wounds from running into boats, while just the flick of a whale’s tale could badly injure or kill someone who gets too close, he said. Boaters that strike a whale could easily be ejected from their boat, he said. If a boater sees a whale, LaCasse said they should turn off their engines and float while the whale passes by. For whalewatching guidelines, visit https://bit.ly/2MVq4O5.